It is really difficult to grasp the significance of lots of big numbers. It is even trickier when the numbers are organised in a hierarchy. For example, yesterday afternoon Bill English, the Minister of Finance, delivered his third budget, outlining the nation’s revenues and expenses. The budget includes details such as how the government plans to spend $21 billion dollars on social development in the coming year of which $9.5 billion will be spent on superannuation, almost $1.9 billion on the domestic purposes benefit, nearly $1.6 billion on accommodation assistance… and I’m already lost. Treemapping is a technique for visually comparing groupings of numbers. A treemap represents a hierarchy of numeric values as a set of nested shapes – usually rectangles. I’m fond of this technique for several reasons, not least because it plays on existing associations. Big rectangles represent big numbers. Rectangles inside other rectangles indicate that one thing is part of another thing. Rectangles can even be shaded to depict an additional variable, for example, an increase or decrease over time. 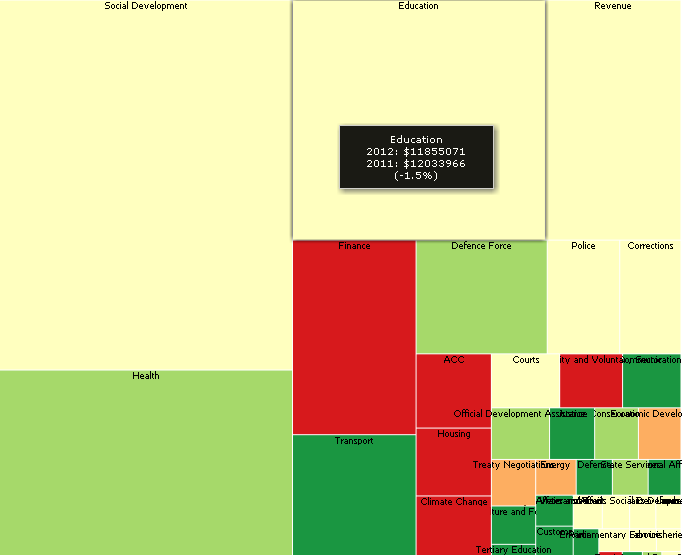 Last night, with the assistance of Keith Ng, I created an interactive treemap of the New Zealand budget. It is available here. I encourage you to have a play with it. Unfortunately, given the large volume of data that needs to be processed and rendered, the visualisation struggles on every browser except Google Chrome. If you have Chrome on your computer, I highly recommend that you use it to view the visualisation. 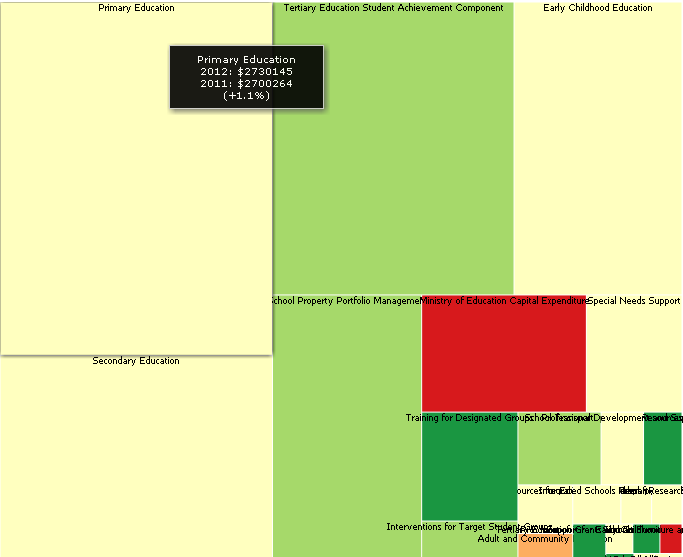 There are two levels to the treemap. The top level shows the breakdown of various expenditure areas. The bigger the rectangle, the more money is being spent. Green rectangles indicate that spending has significantly increased since the last budget; red rectangles indicate a decrease. When you click on any spending area, the visualisation will dive into that area and show a detailed breakdown. If you are interested in learning more about treemapping, I suggest you read Ben Shneiderman’s account of how he developed this class of visualisation and Thomas Kerwin’s survey of treemap techniques. Wikipedia has handy list of software if you want to create your own treemaps. Keith Ng also has a very cool data visualistion tool to contrast and compare spending over between votes and between years. @JJW – Absoultely. I should have linked directly to Keith’s work. Keith passed on his data to me and explained many of the gory details concerning how to interpret the data. I though I’d point out the gosh-darned-prettiest tree map I’ve ever seen. A “stained glass plot” of the expression levels of various genes in various function-based classes. Not only pretty – much more informative than the usual approach which is something like a pie chart (I’ve seen 3D… in PNAS) and a heat map (about 80% are green to red…) to show relative intensity of expression. the visualisation struggles on every browser except Google Chrome. FWIW, I have an interest in Voronoiâ€™s too, but for analysing molecules. This is just brilliant Chris (and Keith). Just brilliant. @Grant – I appreciate you letting me know that it’s okay on Safari, Grant. I would love to see Voronoi treemaps applied to understanding molecules. I have no idea how that sort of data is typically structured. Any pointers on places to learn more? @Jennifer – I’m glad that you found this useful. That makes me happy. @Grant – Have a look Macrofocus TreeMap, which has a working Voronoi treemap algorithm.